Mermaidens are defined by intricate and unique songwriting, boldly raw – yet increasingly refined – studio production, and a hypnotic live synergy that leaves audiences enchanted. The three-piece outfit from Wellington, New Zealand draw inspiration from bands like Warpaint, Fugazi, Exploded View and Sleater-Kinney, offering a mesmerising dip into the realms of post-punk and psych. Mermaidens burst onto the New Zealand scene with their widely acclaimed debut EP O in 2014 and went on to release their debut album Undergrowth in 2016. As a result, they were offered dozens of shows and international support slots, which led to them being picked up by Flying Nun Records. The band are set to release their first international album, Perfect Body, on 4 August 2017. Perfect Body features many of the familiar characteristics of the Mermaidens’ sound, with twinkly, reverb-laden guitar lines, rich vocal harmonies and vibrant drums. They have expanded on these sounds, bringing in even more dynamic elements, building richer melodic layers and a wider range of guitar textures, as they explore different levels of dissonance. Each song bursts with energy and variety, with contrasting light and dark, and they’ve left space for mellow and brooding instrumentals underpinning a powerful vocal melody. To celebrate the release, Mermaidens are taking Perfect Body on tour around Aotearoa. The band’s impressive portfolio of support slots and sold out shows attests to the charm and excellence of their live performance. 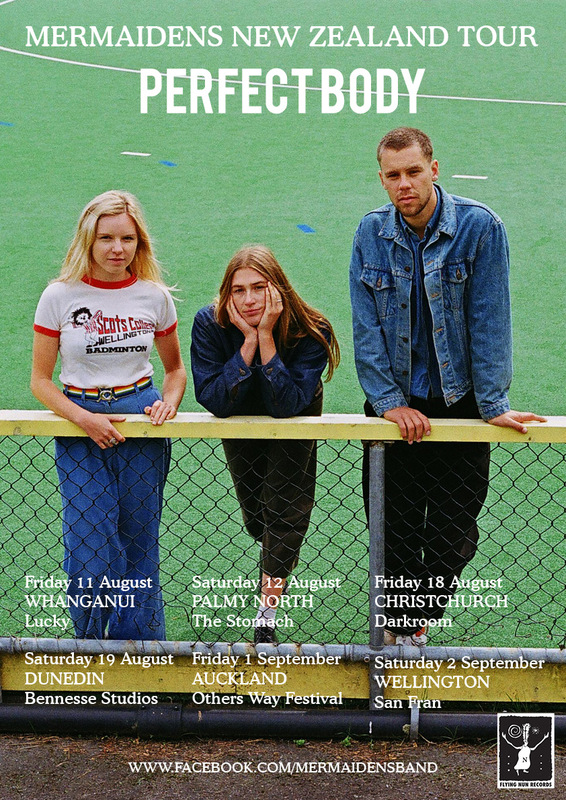 In just a few years Mermaidens have sold out major venues in New Zealand as well as supporting acts such as Death Cab For Cutie, Sleater Kinney and Mac Demarco. Don’t miss this band in the heat of their new record, Perfect Body, on tour around the country this August/September -they’re set to make a similar impact on the global music scene as they have at home in New Zealand. Tickets are on sale now from Under The Radar and the Flying Out store.